What Duties do Retired Greyhounds Perform? Retirees wear madras plaid pants, go to Early Bird dinners and play golf. You are not going to get plaid pants on your retired greyhounds but they still enjoy some fun activity. They have spent the better part of their lives running after some type of lure and they do enjoy chasing things, it is stamped into their DNATo watch a greyhound run is like watching poetry in motion. Their fluid effortless motion while running is like nothing you have ever seen before. My Murphy was the consummate athlete; he would go out in the yard every day and run his laps. He would grab a toy, give it a shake then make sure I was watching him and he would run like the wind. Four or five laps around the yard and he was done, he would then drop the toy at my feet and stand there for his petting and praise of his work. I would hug him and tell him he was a Winner!! Your retired greyhound may enjoy Artificial Lure Coursing. A plastic bag is tied to a fishing line and dragged through a series of stops by a pulley. The Sighthound is made for this type of sport. They run as an individual so there is no competition and when they come across the finish line their owner is there to give lots of love and praise for a job well done. “Can we do this???? Can we, can we---PLEEAAASSSSEEEE????? Most of the events are under the direction of the American Sighthound Field Association. But there are some local groups who organize events for members with sighthounds. It is just for fun and the owners have almost as much fun as the greyhounds. If your dog is free of track injuries and in good physical health this is a really fun way to enjoy watching them show off for you. It is their way of saying “thank you for allowing me do be your greyhound”. But maybe your retired greyhound had a track injury and coursing is not in their future, they also make fantastic Therapy Dogs. They must be certified and in good health but bringing your greyhound into a hospital or nursing home is a wonderful experience for you, your greyhound and most of all, the patient. Some long term care facilities have adopted greyhounds as residents of the facility. It is very therapeutic for patients to interact with a gentle soul who wants nothing more than to rest their head in your lap and just be there for you.There have been studies which show that the mere act of petting an animal can lower blood pressure. Personally it just makes me feel good. We have also enjoyed getting together with other greyhound people and go for a nice long walk. Our rescue group would e-mail all of us who live in the area and say there was going to be a Greyhound Walk at 1pm at the park. This is a wonderful way for greyhounds to “keep in touch” with each other and exercise their people. Greyhounds are Pack Hounds, they have always been surrounded by lots of other greyhounds and enjoy these get togethers. 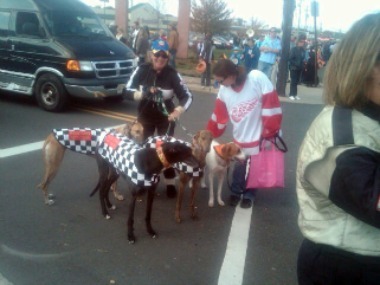 My friend’s son and his race car rode on the float and we put checkered jackets on the greyhounds. We were winners!!! So many people watching the parade applauded our efforts in saving retired racers and giving them a happy life. You will find after welcoming a greyhound (or two) into your home that your life will become richer and fuller than you ever expected.